Realtime-Spy is the FIRST remotely installable monitoring solution designed to provide convenient access to the monitored PC you own from ANY LOCATION without the use of IP addresses and direct connections to the remote PC! 1. Before choosing Realtime-Spy you must first acknowledge and agree to the fact that you are the owner of the remote PC you wish to install the software on. It is a federal and state offense to install monitoring/surveillance software on a PC of which you do not own. 2. 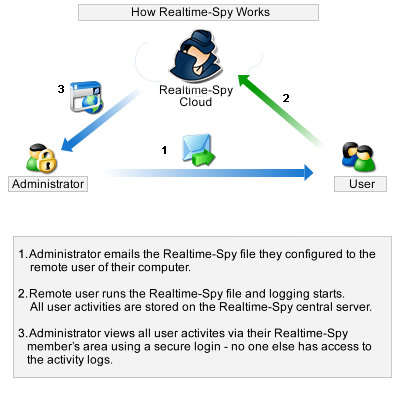 Realtime-Spy's member's area allows you to create a remote install module that you e-mail to the remote PC you wish to monitor. You can attach this file you create to an email, and then send it to the remote PC. From there the user must download and run the attached file to install Realtime-Spy. Once the user runs the file and accepts the install confirmation, their activities will be stored on our servers, so you can view them from any location - securely, of course. You can also physically install the created logging module onto any computer you own. 3. Some e-mail systems may block executable attachments - do not worry, however, as this can be avoided. To bypass executable blocking by the remote e-mail server, you can drag and drop the Realtime-Spy module into a WORDPAD or Microsoft Works document. From there you can email this doc file with the embedded executable to the remote user - if they open the doc, and double click the executable - then Realtime-Spy will be installed once they accept the installation confirmation. Zipping the file with our built-in ZIP compressing feature works as well. 4. If the remote user does not download the Realtime-Spy module, run it, and let the software install, then the software will not work - you will have to physically install the software. We are not responsible for getting the user to execute the logging module that you send them, nor will refunds be granted if they refuse to run it - as you can still physically install the software on your computer. Realtime-Spy can be installed remotely onto your computer via email or file transfer by sending the logging app file to your remote PC. When the user runs and accepts the installation file Realtime-Spy installs itself and invisible stealth monitoring begins immediately, and logs are updated in real-time.